The 'Gingerbread House' is a one-of-a-kind storybook A-Frame chalet or "Tiny House" with a loft. Absolutely adorable, loaded with charm and character however this may not be suitable for some guests. The loft is accessed by way of a ladder with a 250 lb. weight limit. There is no bathroom or water in the loft, nevertheless this is probably the nicest rooms on the property. Set up in the trees offering the feeling of being in a tree house. A fantastic spot to relax, perhaps read a book, take nap on the queen size bed (clean linens provided) or even just meditate. The main level offers a small well equipped kitchenette with a small refrigerator, microwave (please do not bring your own cook-tops, hotplates or griddles)a large kitchen sink and a farm house table with seating for 2. There is a BBQ on the patio for your use. The living/sitting area has a futon couch which makes a full size bed perfect for those who would rather not sleep in the loft or perhaps a 3rd person. There is a small 28" Samsung smart TV with Direct TV's middle package. This cottage also offers wireless internet. Adjacent to the kitchen is a full bathroom with the “charm of yesterday” including a claw foot tub with the shower overhead and separate sink. Please note the water heater is 20 gallons only. Fresh clean towels that have been washed with Eco-friendly soap are provided for your use. The stepping stone walkway outside leads to a small covered patio area perfect for relaxing after a day of adventure and BBQing a meal. Come try the "Tiny House" Living. This was a property my partner Mike and myself purchased for our retirement however, we found ourselves here sooner than we expected. We had the cottage rented a full time tenant for years until we moved onto the property. We then used the cottage for friends and family when my good friend Kirsty Lebovitz from SierraScape Vacation Rentals suggested that we turn the cottage into a vacation rental for two. So we decided to do it. Thank you, Kirsty! I'm a Realtor with Kelly Williams Realty. I've been practicing for 20 years and love real estate! My partner calls himself the "technician" and is a master at all trades. He is my partner in real estate and manages all the handyman and property maintenance required on this property. 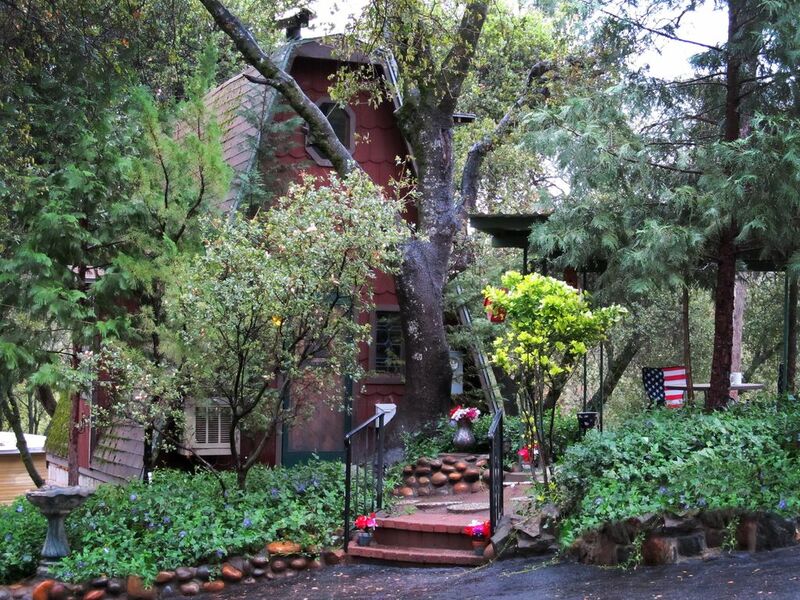 This is a fantastic location and convenient to 3 major attractions, lots of restaurants, less than 2 minutes from Oakhurst's town amenities yet we are nestled on 3 beautiful acres. Please note we are NOT a remote mountain property. The gates to Yosemite are approximately 20 to 30 minutes away the the Valley Floor is an additional 30-40 minutes from the gates. The Beautiful Bass Lake is within 15 minutes or so. There are often events & activities happening. Hiking, boating and boat rentals, picnicking, swimming and the real estate is awesome. We are an alternative to a hotel/motel, renting a full size home and of course camping! On our shared 3 acres we have 3 separate living quarters all unique and loaded with character. They are all separate from each other and each have their own yards and driveways. Less than 2 minutes to Oakhurst's town amenities. Wall AC upstairs in the loft only. Not really a living room in this tiny house however there is a small sitting chair and a full size futon couch. Small Dorm room size. Tiny freezer big enough to hold a couple of frozen meals. We supply paper towel, napkins, coffee filters, salt & pepper, new sponge, hand and dish soap, garbage bags, sandwich bags, foil, plastic wrap. 4 dinner plates, 4 salad plates, 4 bowls, 2 tall glasses, 4 cups, 3 wine glasses, 4 spoons large & small, forks, knives. Can opener, pancake turner, tongs, cork screw. Mixing bowls. Direct TV's middle package. No local channels at this point due to tree coverage. Small covered patio area just outside. The unit is tiny. 20 gallon water heater. May not be suitable for bathers. Ladder to access the sleeping loft. 30 amps of power so running more than 1 high powered appliance at a time may cause the breaker to break. Yes, the house was small but it was perfect for the two of us. It is very charming and was also very comfortable. We used the house as ground zero for our first trip to Yosemite Park. The house is approximately eighteen miles from the south entrance to the park which makes for easy access. During our stay we would leave early morning for the park and return to the house in the evening to "recharge" for our next adventure. We used the grill and microwave to make some pretty impressive meals. The lack of a stove actually made clean up easier for this busy couple. The large coffee maker also helped a lot in the early morning. The kitchen is stocked with all kinds of cooking utensils, dishes, and a small fridge that was more than sufficient for us. All linens and towels were also provided, the shower was adequate for us, and the bed in the loft was very comfortable, we both slept well. Sharon and Mike also provide a lot of maps, literature, and brochures about Yosemite Park, local restaraunts, and other interesting activities in the area. We used them extensively while planning for our days out and about. An interesting note, we did not realize that they currently have two rentals on the property, and a third one about to be completed. They are relatively small but very close to each other. They could provide a great destination for couples traveling together, our even for a family vacation that would enable you to share social time together outside on the patio, then allow you to retreat to your own private space. We will definitely use the Tiny House again when we return to visit Yosemite in the future. Many Thank's to Sharon and Mike. We enjoyed our first Tiny House experience. The surroundings were very relaxing after long days of driving and sight seeing. If back in the area, we would look into staying here again. Loved the peacefulness of the location everything was perfect, wished we had more time there. My favorite was meeting Sarah and getting to give her an apple and talk to her Thanks for all the special touches. Cute, comfy little house located super close to Yosemite. We really enjoyed our stay at Yosemite suite retreat. Everything went smoothly and Sharon was great to work with. The only reason for a 4 star review and not a 5 was the inability to relax in a nice warm bath after a long day of hiking because the water heater is small. If your not the type of person to enjoy a bath, I definitely recommend this tiny house. It was amazing to stay in this place. There was lots of food already provided, plus a range of suggestions of things to do in the areas. We greatly enjoyed our stay and would certainly go here if we came back to Yosemite again. Very nice stay, quaint unit, nice location. Very enjoyable with everything we needed! FABULOUS TIME FOR A VISIT! We are located within 1 mile from the center of Oakhurst’s town amenities including CVS, Rite Aid, Vons and Raleys grocery stores, gasoline and all the town amenities that you’ll need. But the best of all is we are the 'Gateway' to the Southern entrance to Yosemite National Park, approximately 12 miles and 8 miles to the popular Bass Lake. We are also close to endless other outdoor activities such as Miami Trails Motorcycle Park, Badger Ski Resort, lots of hiking, horseback riding, whitewater rafting, gold panning, fishing, biking, golfing etc. So, no matter what your adventure is, Yosemite's Suite Retreat is the place to relax in a tasteful, peaceful environment within easy reach of everything you want to do. Please note the Off Season prices do not include Holidays. Holiday pricing will be as follows: $135.00 per night for the Holiday night plus 1 night before and 1 night after. Please see the Vacation Rental Agreement with the attached Rules & Regulations prior to Reserving/Booking. If acceptable please proceed to Booking which means you have acknowledged and accept the terms and conditions of the agreement. We will occasionally accept and additional person for an additional fee of $35.00 per night. Nov-Feb $125.00 Security Deposit $200.00. March-April $125.00. Security Deposit $200.00. May-Sept $125.00 Security Deposit $200.00 October $125.00 Security Deposit $200.00 Security deposit is refundable if cottage is left in good condition. 11% Combined County Tax/Assessment on rental rates. $50.00 Cleaning fee. All is based on 2 person occupancy up to 3 nights. Prices are NOT Holiday Rates. Please see above pricing.